On this page you'll find a selection of items belonging to the group of legumes and legume products. Through the links on this list of foods that are legumes and legume products and you will know their properties and amount of nutrients that each food has. Below is a list of foods belonging to the category of legumes and legume products. Clicking on each one of them, you can view the properties of oils and nutritional information in addition to the benefits to your body. 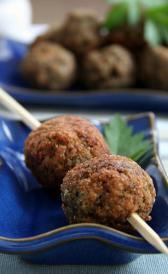 Meatless meatballs: High in protein, phosphorus and copper and low in total sugars, manganese and selenium. Vegetarian fillets: This food is low in total sugars, manganese and selenium but Vegetarian fillets has protein, ash and phosphorus in high quantity. Meatless sandwich spread: This food has a low quantiti of selenium, vitamin c and folic acid but has a high quantity of magnesium, copper and thiamin. Vegetarian stew: High in magnesium, copper and thiamin and low in total sugars, manganese and selenium. Meatless bacon bits: High in food energy, protein and total lipid and low in water, total sugars and manganese. Curd cheese soybean: This food has a low quantiti of total dietary fiber, total sugars and sodium but has a high quantity of magnesium. Tofu yogurt: In this food there are some nutrients that are found in low quantity, for example total lipid, total dietary fiber and total sugars.